This week our classroom stitching continues as we begin to create fish beanbags. First they have to trace, then cut their patterns. One girl has set out to create a "zebra fish". Their stitching was taking over my desk...so now that many of them have grasped a few basic stitches, we've designated a table that they can sit together and stitch at once their work is done. I'm most impressed with their individuality. I've relished in the fact that their creativity is untarnished and without boundaries of "right or wrong". They have each set out to create their very own little fish, like the little zebra fish above and I've noticed them to be terribly encouraging of one another. Oh and that poor guy in the red shirt. He soooooo badly wants to learn how to sew...but for the life of him, can't thread a needle nor complete a basic running stitch. I finally packed him an"at home" kit in hopes someone at home can help get him started. I've seen no tongue in cheek concentration but they beg to stay in at recess to stitch and I've noticed their conversations are light and happy as they each focus intently on their own little project. There's still many elephants in the works and I'll have to take a better "inventory" of everyone's progress tomorrow....as with thirty students, I'm sure I've missed someone or something. LOL! Until then...happy stitching everyone! Thanks for stopping by and cheering us on. They measure about 68x88 and ya need about five yards of backing to finish a twin size quilt. I knew exactly who I wanted to highlight for this week's post: Jasmine who blogs at Quilt Kisses. As along with being a busy young mother of her adorable boys, she creates a home full of quilty love. The quilt on the left was donated to my classroom from Sharon. I got it quilted during spring break and the brown polka dot binding on today. I also quilted my H2H Pirate quilt and don't ya just love the little skull/cross bone binding I found to finish it?! Today was one of those days I just got going in the studio. Hubby used the afternoon to go pick up our outdoor fire place and I decided to stay home and spend the afternoon sewing. It felt soooo good! I'm definitely looking forward to this slow stitching during evening TV this upcoming week and I'm looking forward to sharing these two finishes with you very soon. Until then....happy stitching! 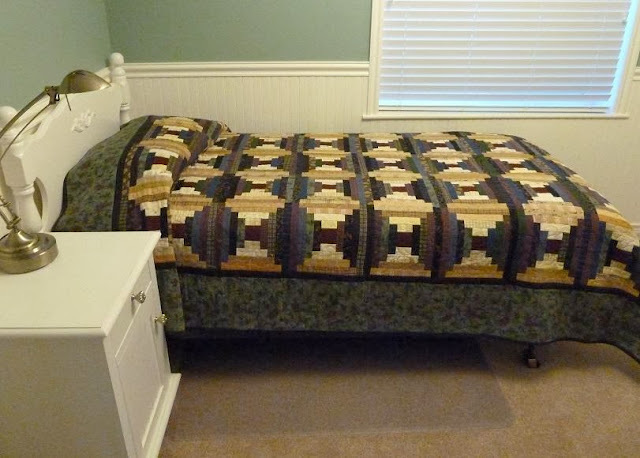 This week's theme: TWIN Size quilts. The stitching continues in Second Grade. First the blanket stitch, then the chain stitch, followed by the running stitch. and asked if anyone had seen it...he exclaimed, "I'm using it for silent reading!!" He is now "my assistant" and helps me teach the other students. It's rewarding to see the elephant parade continue. .I especially love how these noses actually roll up! 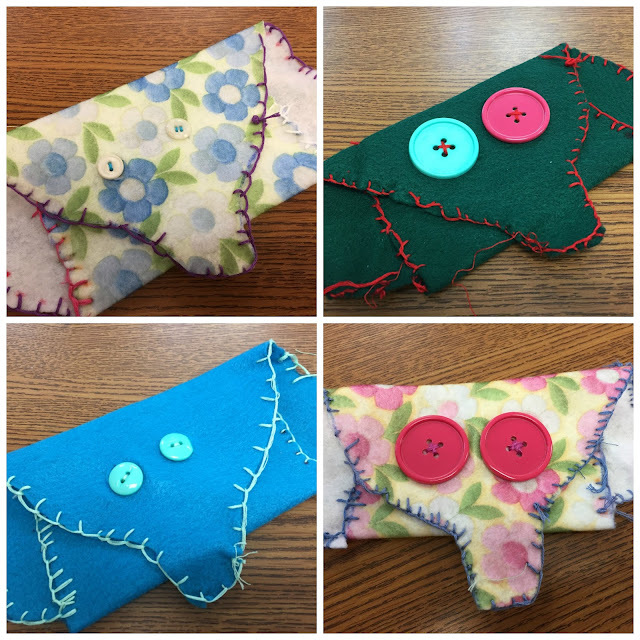 Creative Stitching has certainly become a relaxing transition between subjects. If you could be a fly on the wall, what are you curious about as the children learn to stitch? This one ended up being auctioned off as a school fundraiser and brought in almost $350.00. That be said, this is the only T-shirt quilt I've made.I wish I had a picture of my son-in-laws, as it's beautiful and was made from him by his grandmother for his high school graduation. T-shirts certainly make for a wonderful graduation gift. Click here to check out past Tuesday Archive Themes. Hoping you had a wonderful Easter weekend. Our grand guy is getting so big and is developing the funniest personality. He makes us laugh. Like that tears in our eyes laughter. When is the last time your had a good belly laugh? Oh it was so fun to watch my second graders tackle their stitching project this week. ended up stitching two of these elephant pouches pictured below and is now "my helper". I had this little felt elephant pattern from when I was young, and thought it was the perfect project for my students especially as I had a ton of felt and thread, so super cost effective for me. Most of them easily caught on to the blanket stitch of which they used to stitch the edges of their elephant. If not, I taught them the running stitch. Once the edges were done, they then had to fold the flap up and stitch it down to create the pocket. This was the hardest part as the kids were using a crewel needle and had to stitch through two layers. Once they were done stitching, I cut two straight holes above the pockets and sewed two buttons to each of their pockets to create the closure and elephant eyes! Oh your guys, the kids LOVED this little project so much that next week I'm going to teach them the chain stitch as they want to continue to sew and add stitches to their little felt elephant. and I think you'll be as amazed as me by their progress. PS: If you would like a copy of the elephant pattern please feel welcome to email me with your snail mail address and I'd be glad to mail an elephant template your way. Happy, happy stitching for sure!! It's little strap goes right around your neck. It's ran by four AA batteries and has two light settings. (I think it even came with a magnifying glass??) Love it! "It's so easy for you, you're creative." Has anyone ever said that to you? I'm always a little bewildered when I'm told this, as in reflection, for me, being a creative person has been anything but easy and truth be told, it's kinda exhausting. My husband and mom can often be found telling me to relax as I'm always doing two things at once. But, I truly can't help it. I'm a life enthusiast. I keep my hair pixie short as there's not enough hours in a day to do everything I want to do, but I know my hair isn't one of them! I'm a thinker. A watcher. I'm imaginative and crave individuality. I love thinking outside the box. But, let me tell you, it's taken a lot of bad ideas in order to make my way to a few good ones. I embrace my failures. I face life's hardest challenges with a conquering spirit. For me, being creative is not a hobby, but a way of life. That's not easy is it? Well, Spring has sprung and so has my motivation to create a "bucket list" of creative experiences I want to fill my upcoming summer with. I'm craving a creative change, though at this very moment, I have no idea what that will look like. Thus, when I saw that Eventbrite is spreading this cool message: "Experiences, Not Things", I wanted to join in as sometimes, our "giftedness" can be found through the most unassuming experiences. I truly believe we all possess skills that are just waiting to be discovered. So I'm pushing myself out of my comfort zone and I thought it was cool to find a website full of events in our own zip code to help me do so. Go to a concert. Okay, okay, I saw Glen Campbell in Vegas when I was very young, and Lionel Richie in Phoenix while in college. I seriously need to improve this list. Go on a hiking/yurt trip with my hubby. Summer hiking rejuvenates my soul! Take an Art Quilting class...my journal is overflowing with ideas. I need to experiment with new techniques and challenges. one student, one quilt, one experience at a time...creating something extraordinary from the ordinary! Good Morning blog friends! The wind has stopped. The rain is gone. Blue skies, blooming trees, green grass and an afternoon of stitching on our new deck is now my afternoon forecast. And now, today I'm looking forward to getting this little wool bunny done and hung. as we all link up and share at Kathy's Slow Sunday Stitching.